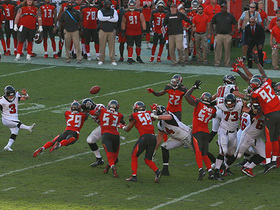 Published: Dec. 3, 2008 at 07:13 p.m.
Roddy White has an uncanny knack for making awkward catches. 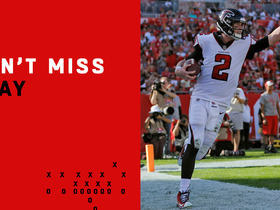 Matt Ryan, then still at Boston College, caught a rare highlight of the woeful 2007 Atlanta Falcons, whose lone star was Roddy White. Ryan was only marginally impressed with the wide receiver. "I thought he was a really athletic player who could make some plays," Ryan said. "I thought he was a solid player, good hands -- a good player." A few months later, Ryan was drafted by Atlanta. "Then you come down, go through your first minicamp, get set to throw some go routes, some comebacks, some out routes and your balls are five yards behind him because he's so much faster and so much more athletic than you think," Ryan said. "The other thing is he adjusts to balls better than anybody I've been around, especially deep balls. He sees where it's going to be, knows where he is on the field and goes and gets it." 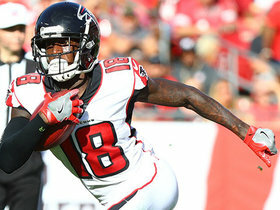 White's ascension to the second-leading receiver (68 catches, 1,085 yards, six touchdowns) in the NFL isn't some instantaneous surge tied to his union with Ryan, the standout rookie quarterback who's helped resurrect the Falcons (8-4) from a pile of ash to playoff contenders. White piled up 1,202 yards and six touchdowns on 83 catches last season but his work was overshadowed by multiple controversies and a 4-12 record. 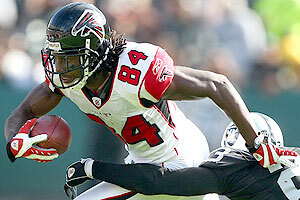 Roddy White has gradually improved each season since the Falcons made the receiver their first-round pick in 2005. Shamefully, White's production was viewed like the leading scorer for the NBA's Los Angeles Clippers; someone has to put up numbers while losses are stockpiled. White is proving last season wasn't a fluke -- and neither is he. He's making plays in double coverages and zone schemes rolled to his side of the field. Unlike a lot of receivers, White can make short catches and break them into long plays. He's pretty much aced the deep ball. His ability to exploit intermediate zones and dish out as much pounding as he receives makes him a tough cover. White is a three-tiered threat who is wreaking havoc on defenses that also have to worry about stopping tailback Michael Turner. "I feel like I should be right up there with those guys," said White, referencing the Colts' Reggie Wayne, Houston's Andre Johnson and Arizona's Anquan Boldin and Larry Fitzgerald. "I've worked hard and paid my dues. Hopefully I'll finish the season, not get hurt, and my numbers will be right there at the top of the league. It will be the second year in a row that I've done that. They say you've got to do things more than once to get notoriety. "You also have to win. The great receivers have made a lot of plays and been on winning teams. That's the most important thing. We've doubled our win total from last season and hopefully can get into the playoffs. You don't win ball games people don't tend to notice as much. Andre Johnson, he's putting up huge numbers but they haven't been winning. He's a really, really good player but not a lot of people know." At 6-foot and 210 pounds, White is a freakish athlete who uses the uncanny balance he gained wrestling as a pre-teen through high school to make awkward catches while remaining in position to spin, duck, run or spring for more yardage. He is known to make sound effects as he runs, usually like a colt darting out of a gate. If he misses a pass where he has to extend, he'll scream in a high-pitched voice as if being pinched in the side. White also giggles. A lot. His accompaniment of noises led some to believe, shortly after being drafted in the first round out of Alabama-Birmingham in 2005, that White was immature. That he painted his newly purchased Chrysler school bus orange and customized most of its interior and engine parts in the same color and airbrushed his initials and a team logo on his ride didn't help perceptions. Neither did White's production. As a rookie, he had just 29 catches, 446 yards and three touchdowns, despite the coaching staff working overtime to motivate him to earn his way onto the field. 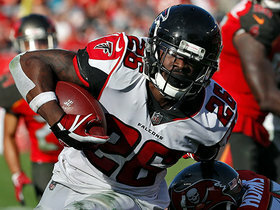 He was a first-round pick in 2005, a year after wide out Michael Jenkins was selected in the first round to give then-quarterback Michael Vick two big targets that could run. White wasn't mentally ready, even though he was by far the most physically gifted player on the roster. Things didn't get much better in Year 2, when White had just 30 catches for 506 yards with no touchdowns. He was labeled a bust, who actually was kept out of a game in Washington, even though dressed, because of a huge drop the previous week against New Orleans. There were concerns he would crack, even after Jim Mora and his staff were fired and Bobby Petrino was hired. But he caught an unexpected break. What White admits now, he probably couldn't admit last season amid a season of revolt against Petrino: The first-time NFL coach that so many players despised -- and his equally disliked brother Paul, the receivers coach -- saved his career. "Coach Petrino came in with a pass-happy offense," White said. "We threw the ball. That dictated our game plan. My first two years we just ran the ball. We led the league in rushing and we were winning games so you can't argue with that. I got my chance when Coach Petrino came in. He made things a whole lot easier. Then Paul came in here and worked us almost to death (giggle). We caught a lot of balls. He just wanted us to get our hands on the ball a lot at practice and in games." Petrino also brought in veteran wide receiver Joe Horn, a needed presence since the entire receiving corps was young, impressionable and in need of leadership. "He came out there and showed us how to work hard and how to get things done on the field," White said of Horn, who asked for and was granted his release before this season. "He's caught (603) passes for more than 8,000 yards and scored a lot of touchdowns. When a guy has done that you can't do anything but follow. He changed expectations for us. We didn't have high expectations but when Joe got here he said we're going to be one of the best wide receiving corps in the league. He told us he'd been around a bunch of players and we are the best he's been around. That was a big confidence booster." After yet another coaching change from Petrino to Mike Smith, White and Jenkins took it upon themselves to carry on what they'd learned from the Petrinos and Horn. New offensive coordinator Mike Mularkey designed a scheme to get them touches, which has allowed both to flourish -- especially White. Mularkey likes to get him involved early, in part because White is a game-breaker who can make something happen each time he touches the ball (16 yards per catch). 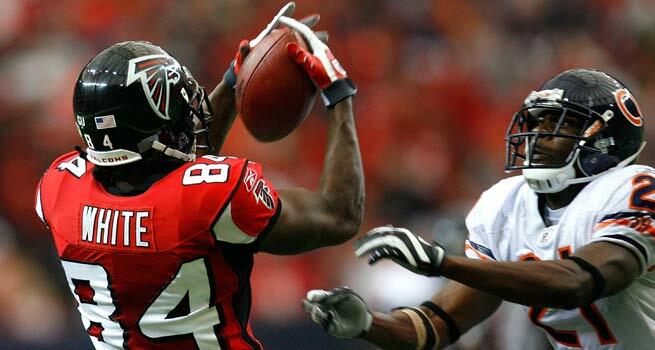 Any receiver will admit that an early reception also helps them focus. So will the sight of single coverage, which White said he gets on occasion because defense drop eight defenders in the box to try and bottle up Turner. With Ryan being cerebral enough to read favorable coverages and defenses out of place to shut down White, plays often are adjusted. Unlike the first few times White and Ryan played catch, they are now in complete sync. "He puts the ball where it needs to be," White said. "He's fitting balls into tight spaces and he's pin-point accurate. When he needs to muscle it in there, he can do that. He's done a tremendous job getting the ball off and giving us opportunities to make catches and run with the ball after the catch." As impressed as Ryan has been with White as a receiver, White's back flip after scoring on a 70-yard touchdown pass in a victory over Kansas City was the highlight of what he's witnessed from his favorite target. "That was incredible," Ryan said. And it was typical White, whose penchant for doing certain things once-perceived as child-like are now considered special.